On an unusually warm night in early February, a crowd gathered outside 1212 San Pablo Ave. in Berkeley. The smell of vegan "carnitas" by Taqueria La Venganza wafted from the grill, mingling with the sounds of DJ Wam Bam Ashleyanne. A few steps from the taquero, people were coming in and out of Somewhere Else, an unusual art space run by Leanne "Elrod" Rodriguez, Mayra Ramirez (aka "Hellabreezy"), and Brandy Esparza. It was the opening night of The Desperate Living Room, a Tribute to John Waters. For the exhibit, Rodriguez, Ramirez, and Esparza curated an all-female lineup, cramming their homages to characters from the cult director's movies into the ten-by-fifteen space. There was also '70s-style wallpaper, a vintage couch, and lamps reflecting the director's kitschy aesthetic. Rodriguez, Ramirez, and Esparza are experts at magically transforming their small space — a former garage — for each show. For the 2016 installation Intergalactus, the curators created a trippy desert landscape with psychedelic lights and otherworldly sounds. Rodriguez, Ramirez, and Esparza opened Somewhere Else in February 2016. 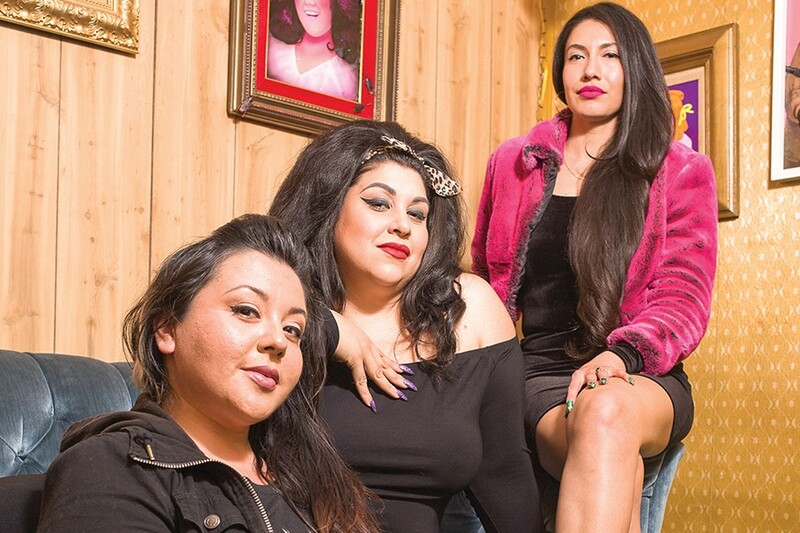 They've all been involved in the local art scene: Rodriguez is an artist and curator, Ramirez is a curator and member of the all-female vinyl collective Chulita Vinyl Club, and Esparza owns Painted Wonderland, a business that specializes in body painting. Rodriguez and Ramirez also happen to be roommates, and the idea of collaborating was always on their minds. Ramirez happened to know the owner of the building, Tom Franco, who also runs the Firehouse Art Collective, because she worked at B League, the vintage shop which is housed under the same roof. (There's another art space, Totally Rad Gallery, in the building as well.) "We went in there and were like, 'Yes! We'll take it,'" Rodriguez recalled during a chat earlier this month at a local coffee shop in Oakland. Getting the space ready was no easy task, however. "We took the rug out, the vinyl floor, the rolled-up broken garage door," Ramirez said. Still, the three knew that the space had the potential to showcase the type of exhibits you won't find anywhere else. That extends not only to the artwork but also the artists. The curators focus on showcasing artists of color, and especially women. This year, Rodriguez, Ramirez, and Esparza are showcasing only self-identified women artists. "The female art revolution takeover," Rodriguez said. "We want to show that women can put on a badass show." Rodriguez, Ramirez, and Esparza started out doing everything themselves, from reaching out to the artists to getting the space ready to marketing on social media. It took four months of intense labor to open their first show, Midnight Love, a solo installation by Omar Juarez (aka EL OMS), in February 2016. "The space at this point, now it's beyond this little circle," Rodriguez said. "It's a collaborative effort of people we know, who have helped us and participated in what we do." The curators are committed to having a new exhibit every other month, always scheduled on the first Saturday. They're now on their tenth installation, which is impressive considering the limited time — not to mention the lack of funds — they have to devote to this project. The labor-intensive part of putting the shows together remains the work of the three of them. Although they showcase art, don't call Somewhere Else a gallery. "I don't necessarily want to call it a gallery, because I feel like that comes with the assumption that there are business hours held," Rodriguez said. "It's a 'freeform arts space.'" This freedom allows them to set aside time to plot what their next installation is going to be, not to mention leave them time for their personal and work obligations. It also gives them the option to take turns curating each installation. February's The Desperate Living Room a Tribute to John Waters was curated by Rodriguez. April's installation will be curated by Ramirez. "There's usually somebody in mind when one of us has a theme," Esparza added. The women acknowledge that typical galleries don't necessarily showcase artists of colors, especially women of color. There's also the monetary aspect of how little money artists take home after the gallery takes its share. "Often, you're making art for the gallery," Ramirez lamented. They take 30 percent from the sale of each piece — a much smaller amount compared to other galleries. "Most artists our age just want to sell something, to keep their fire going," Esparza added. "It's a big drive for artists to sell [at Somewhere Else]." The ladies know the importance of creating a unique experience, not only for the artists that they showcase but also for those attending their shows. What you will always find: a DJ and a local food vendor. (Tacos Oscar, Tacos Sincero, and Tacos El Ultimo Baile have been some of the food vendors that have taken part in the openings.) "We've been their launch pad," Esparza joked, while Rodriguez and Ramirez laughed, nodding in agreement. In following with their "female art revolution takeover," the women want to showcase more female food vendors as well. But how long will it last? The women are worried that gentrification will push them out of their space eventually, noting that the building next door, which used to be Church's Chicken, will soon turn into a six-story condo building.